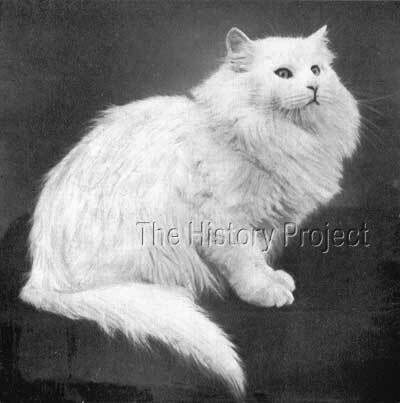 When we delve into the history of 'Champion Purity' we are required to glimpse into the life of one of a new generation of breeders of White Persians on the American continent; those that came well after Mrs. Clinton Locke , Mrs. Leyland Norton, and Mrs. Cratty of Chicago, whose interest in cats could be traced back to the 1880's and 1890's; to those that started either just before or immediately after the turn of the twentieth century and after the emigration of Mrs. Florence Champion and her daughters Dorothy and Ethel Champion, from Surrey in England to Staten Island, New York. 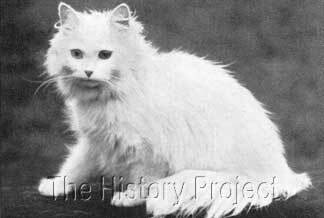 Although she was at the time, one of America's youngest new breeders, within a very short space of time she could none-the-less be counted among one of the most successful breeders of white Persians of that era. This was Miss Ava Pollard, of Elizabeth, New Jersey. It would be fair to say, that the toughest competition in Persians was with Blues, Chinchillas and Whites and in the general New York area, the Champion family, with their extensive knowledge from the old world, had a distinct advantage. It seems very likely that the young Miss Pollard, soaked up all the information about white bloodlines that she could, noticing that the experienced Mrs. Champion had based her imported lines on 'Champion White Friar', whom she had previously owned in England and left with Mrs. Finnie Young and Miss Mary Hunt in Scotland in 1900. This enterprising young lady, then approached Mrs. Hunt directly, aiming at procuring a daughter of two of a pair of the most famous whites in England, with a proven history of producing excellent and highly sought after progeny, namely 'Champion White Friar' and his renown mate, Mrs. Hunt's 'Champion Crystal1. The story of how the youthful but enterprising Miss Pollard got her start in breeding is an intriguing one, and we have an enlightening record of it, written by F.H. 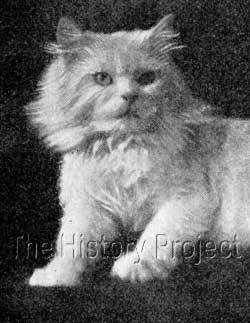 Morrison, in an article on "The Aristocratic Persian Cat" published in 'Country Life In America' in 1908. 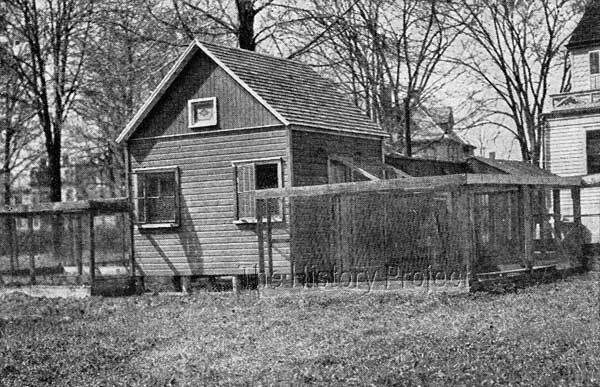 Exterior view of Miss Pollard's successful New Jersey cattery. 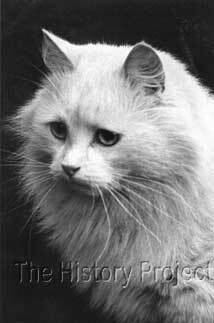 'Purity', who was just one among a number of cats successfully imported by Miss Pollard over a number of years, was born on 16th February 1901. Her sire, was 'Champion White Friar', a blue eyed white male who was arguably the most famous white male in the world at that time. 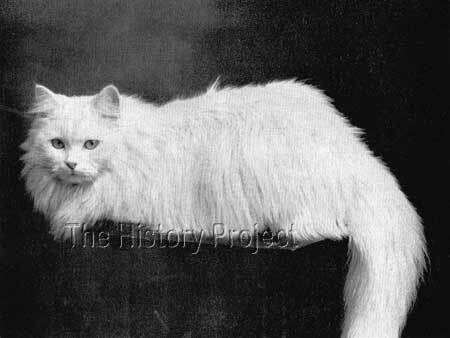 Her dam, 'Champion Crystal' was also among the most celebrated white Persian females of the era and the subject of many a postcard. One can only imagine the excitement for Miss Ava Pollard on knowing that she had managed to procure such a treasure, and a half-sister of Mrs. Champion's noted odd-eyed white imported queen, sired by 'Champion White Friar'. It seems very likely that Mrs. Champion may have taken the young Miss Pollard under her wing and no doubt impressed by her dedication, may have even acted as a referee in recommending that Mrs. Hunt export to her. 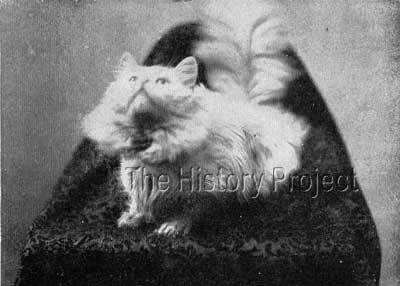 But white Persians were not Miss Pollard's exclusive interest, she also bred Chinchilla's. One of her most famous was 'Omar I' (aka 'Omar Omar')(BCC:286)? bred in England by Mrs. Edmondson of Warwickshire and imported by Mrs. Frank Baker of New York, who later sold him to Miss Pollard. From this male, she bred his namesake 'Omar Omar II' born 4th May 1902 (BCC:740)5. With having such famous parents 'Purity' could count among her full, sire, and dam siblings, a great many well-known cats. Full siblings included Mrs. Kerswill's 'Blue-Eyed Edelweiss' (aka Edelweiss of Kensington)(born June 1899-ICFAGB); Mrs. McLaren Morrisons 'Ladysmith' (Born 17th October 1899); Miss White Atkins 'The White Butterfly' (also born in 1899); Miss White Atkins 'Snowbelle' (date of birth unknown); and litter brother, Mrs. Edwenia Baxter's 'White Friar II'. Among the many sire siblings may be counted Mrs. Champion's odd-eyed white queen, 'White Friar's Daughter' (ACA:92)7 bred by Mrs. Horsman in England and out of a Blue queen 'Nonna': Mrs. Everett M. Davis' 'White Friar Junior'(USR:94)14 who was imported in dam, out of 'White Lilac'; Mrs. Champion's 'White Tsar' (ACA:133)7, out of 'White Witch'; Mr. Frank Abbott's female, 'Kensington White Nymph' (OC:08/Dec/1900)15, also out of 'White Witch'; Miss Ellen Woodhouse's 'Beautiful Spring' (OC:20/Jun/1903)16 bred by Mrs. Kerswill out of her odd-eyed white imported queen,'Kuishah'; 'Blue-Eyed Sirdar' and 'Blue-Eyed Prince', bred by Mrs. Bryson, with 'Sirdar' originally owned by Miss A Finnie Young but eventually being exported to Mrs. Eames Colburn in the United States. Others included 'Chiswick Snowflake' and 'Chiswick Snowball' bred by Mr. Ernest Smith; Mrs. Pettit's 'Piquante Pearl II' out of her 'Beautiful Pearl'; Mrs. MacKenzie Stewart's 'Nuns Boy' and 'White Nun's Girl' out of 'White Nun'; and last but certainly not least, 'White Abbess', bred by Mrs. S.E. Horsman and sold Mrs. E.E.Baxter. The 'White Abbess' then appears to have passed to Mrs. E.G. Rock, who bred her to the 'White Knight' (aka The White Knight of the Midlands) to produce 'Blue-Eyed Fairy'. This breeding was significant, in that it linked two of the greatest white lines in England, and 'Blue-Eyed Fairy' was subsequently exported to the 'Omar' Cattery of Miss Ava Pollard! Although we know that 'Champion Purity' was shown successfully, we have only limited confirmed results available to us. From her registration records with the Beresford Cat Club, we glean that she was shown in England first, where she gained nine Firsts, two Seconds and six Specials. Her first American wins appear to have been a First and Specials in New York in 1903. We are, however, told in the article by F.H. Morrison that she won all told, forty-seven prizes and trophies1. 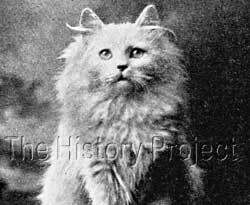 The real value in her however, was in her breeding and potential as a breeding queen which was soon realised when, out of four litters between April 1903 and September 1906 she produced two outstanding cats, namely 'ACA Double Champion White Monk' and the sublime 'Champion Puritana'. 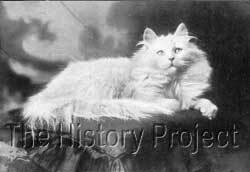 Her first litter was to Mrs. Champion's odd-eyed white male 'White Tsar II'. (ACA:246)7(CFA:83)6, which was a distant doubling on her sire 'Ch. White Friar' who was also grandsire to 'White Tsar II'. From this came the yellow-eyed male 'Champion White Monk' born 6th April, 1903. Miss Pollard retained 'White Monk', breeding him to her imported blue-eyed white queen 'Blue-Eyed Fairy', to produce 'Periwinkle', another Blue-eyed white female who was subsequently kept with her breeding program. A repeat of the breeding which produced 'White Monk' resulted in an odd-eyed white female 'White Deutzia' and a yellow-eyed white male, 'White Tassell' in April, 1904. 'White Tassell' was sold to Mrs. T.L. Drake of Fort Worth, Texas. By 'White Tsar II' out of 'Ch. Purity'. In the period between the second litter and her third, Miss Pollard imported UK 'Champion Oberon', who had been bred out of Mrs. Kerswill's 'Edelweiss of Kensington' and sired by 'White Knight'. He was the perfect fit for her cattery bloodlines, his dam was a fill sister to 'Purity' and three quarter sibling to her other imported queen 'Blue-Eyed Fairy' who was also sired by 'White Knight' and out of another daughter of the 'White Friar'. 'Champion Purity' was, of course, bred to 'Champion Oberon' and from this pairing, on 23rd March, 1905, came the blue-eyed white Persian queen 'Puritana', whose sensational show career was never to be equalled. In her show wins listed in the first volume of the Stud-Book & Register of the Cat Fanciers Association we find that she took Firsts in the Kitten Class and Novice, at Rochester in 1905; 1st New York, 1906; 1st, New York, January 1907; and 1st, New York, December, 19076. Miss Ava L. Pollard's ' Champion Puritana'. 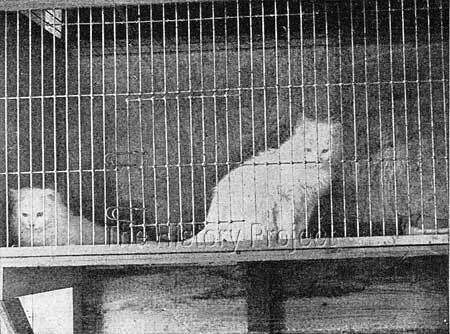 In her last litter of record, 'Purity' was bred to a relatively unknown blue-eyed white male named 'Baynton Grip', who appears at least to have come out from England and was owned by Miss Ava Pollard. 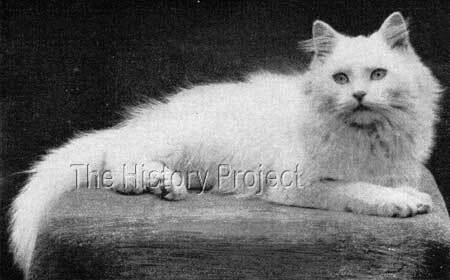 In a litter born 20th September 1906, 'Purity' produced three white females all with different eye colours. 'Lady Bothwell', an odd-eyed white, 'Lily Baynton', a yellow or copper-eyed white, and 'Purity II', a blue-eyed white. 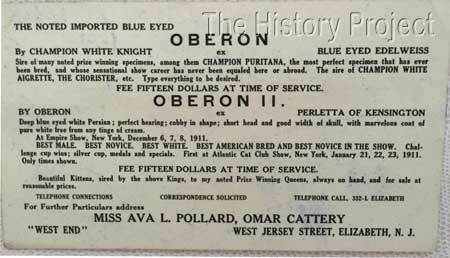 The below business card, from Miss Pollard's cattery, proudly proclaims the pedigree and successes of her imported white male 'Oberon', himself sired by the magnificent 'Champion White Knight' and of one of the most famous daughters of 'Champion White Friar' and 'Champion Crystal'. Of course, 'the dam of 'Oberon', 'Blue-Eyed Edelweiss' was a full sister to her own 'Champion Purity'. With the story of 'Ch. Purity' and her owner, we can see the evolution of a young and passionate breeder, with quiet resolve, drive and determination. Miss Pollard grew from a teenage fancier to become one of the most respected breeders of Persians on the eastern seaboard of the United States. She continued to import many lovely cats, branching into blue Persians and expanding on her chinchilla lines. The 'Omar' cattery was widely recognised and serious fanciers always knew that Miss Pollard would only be breeding from the best available bloodlines and knew how to weave together great pedigrees to produce consistently superior stock. She even dabbled in Bi-colours considering that nothing was too much of a challenge. But her Whites and Chinchillas remained her first love. Young people bring a new vision and much-needed enthusiasm into the hobby of cat fancying. We have a responsibility to encourage and support them in their chosen breed; for these are the owners, exhibitors, breeders and judges of the future; to whom we need to pass the baton, along with our knowledge and experience, in what should be our common love for the cat.